The South African Air Force seems to have completed its re-assessment of its future fixed-wing transport aircraft requirement, including that for a strategic airlifter, following last year's cancellation of the acquisition of eight Airbus Military A400M large transport aircraft last November. That is if comments made by Minister of Defence and Military Veterans Lindiwe Sisulu at Friday's media briefing by Cabinet's International Cooperation Trade & Security cluster were correctly interpreted. She said the defence department is “ready to put before Cabinet the necessary document that will assure that we can get this capacity and proceed with the necessary procurement processes. Meanwhile, it is understood the cancellation – and matters arising – was a discussion point between French trade minister Anne-Marie Idrac and SA public enterprises minister Barbara Hogan, who met last week in Cape Town. Idrac, accompanied by a large Airbus delegation, afterwards announced that state airline South African Airways had completed arrangements to lease six new A330-200 aircraft in a R7 billion (US$1 billion) deal. Cabinet tasked the flying service with reviewing its fixed wing mobility capability after terminating the A400M contract. Cabinet spokesman Themba Maseko and Sisulu at the time said the SAAF would now re-evaluate its transport requirement and issue a new tender accordingly. "We have as one of our priorities the acquisition of strategic military air transport capability,” Sisulu told the Joint Standing Committee on Defence. “We have terminated the contract with Airbus but we've not terminated our quest to ensure we have the necessary capabilities. That is very clear." She made the point again on Friday, saying she was “battle scarred” from efforts to retain the R4.7 billion previously allocated in the medium term for the A400M acquisition in order to fund a strategic air transport capability. “I am battle scared fighting for ... this money to come to me because we need this capacity and the reasons why we cancelled the contract had nothing to do with our needs,” she said. She also expressed optimism that Airbus would refund SA some R2.9 billion already spent on the plane. The minister was also upbeat the money would come back to her department to augment her air transport war chest rather than revert to Treasury. The latter is the invariable practice. Air Force chief Lt Gen Carlo Gagiano in late January said SA's exit from the A400M programme had “obliged us to reconsider our fixed wing mobility capability in its entirety, from VIP, strategic airlift, medium range transport down to battlefield air transport.” The review also includes aircraft to perform the maritime patrol and surveillance tasks. Although the SAAF has a nominal fleet of nine upgraded Lockheed Martin C-130BZ Hercules in the medium transport category, at least two have been removed from service, while a further aircraft is damaged, having recently suffered a nose undercarriage collapse. Also in the medium category is a single CASA CN235. The light transport fleet consists of approximately four upgraded C-47TP Dakotas in the transport role, three CASA 212 Aviocars and eleven Cessna 208 Caravans. A further four or five C-47TP Dakotas operate in a limited maritime surveillance and electronic warfare roles. The average age of these transport aircraft is 42 years, ranging from 75 years for the C-47TP Dakota, through 47 years for the C-130BZ Hercules to the youngest, the Cessna 208 Caravan which itself has been in SAAF service for 21 years. The SAAF has a small but diverse VVIP (Very Very Important Person) and VIP (Very Important Person) fleet. The flagship is the presidential Boeing BBJ VVIP jet that was delivered in 2001. Other VIP aircraft in the fleet consist of one Dassault Falcon 900 and two Falcon 50 jets, two Cessna Citation jets, three Beech Super King Air and one PC-12M turboprop aircraft. The average age of this fleet is 20 years. Brig Gen Tsoku Khumalo (Director Air Transport and Maritime Systems) told the defenceWeb Maritime Security Conference last year that the SAAF had a requirement for five specialised Maritime Patrol Aircraft (MPA) and eight cheaper general-purpose Maritime Surveillance Aircraft (MSA). The MPA, while having a maritime role, also needed to have a transport function and would also replace the C-47 and Casa aircraft; Khumalo being keen to reduce the number of platform types in use in the SAAF transport environment. While at pains to avoid mentioning manufacturers or aircraft models for fear of creating perceptions, Khumalo did acknowledge that to have the range for maritime operations (the SA SAR region is some 17.2 million square kilometres in size) and to have a useful cargo capacity the aircraft would have to be of the size and capability of the CASA 295. The MSA would be of a similar size to the Beech 350ER. 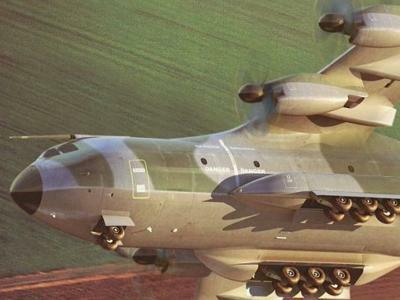 The A400M strategic transport, unlike the Hercules, would have been capable of carrying the Oryx helicopter without dismantling the main rotor gearbox, as well as providing an air-to-air refuelling (AAR) capability to the Gripen fighter. There is no direct competitor to the A400M and purchasing a larger and more capable aircraft, such as the American Boeing C-17 Globemaster III, may be prohibitively expensive, whilst still leaving a gap in the air-to-air refuelling environment. With acknowledgements to Leon Engelbrecht, Dean Wingrin and defenceWeb. As always with the new SANDF, as clear as mud. Keeping all the options until the most generous splodger emerges from the wolf pack. It would be quite diabolical if the A400M were again selected, even if it made it to the consideration list. That would be a clear sign of traditional EADS generosity..
Come back, all's forgiven. Here's your Swiss PIN number.